salad | eat. live. paleo. We’re loving kale salads these days, so I’m always on trying to come up with new ways to “dress” the healthy greens. I recently came up with a simple dressing that worked very well. I added some toasted pecans in the salad, since they were so nice in the “Red (Purple) Salad” I’ve made before. I think the pecans add a nice earthy flavor as well as texture, and complements the heat from the serrano chili. The salad pairs well with meat, such as a pork chop, but it’s also great on its own. It keeps well and tasted great the next day, too! 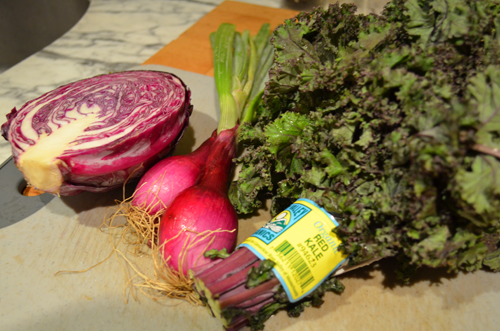 Having been inspired by Jo Robinson’s book, in which we learned that purple vegetables are great for you, I have been compulsively buying purple/red vegetables when they look good at the super market or, even better, at the local farmers’ market on the weekends. Last night, I made a refreshing and summery salad from red cabbage, red kale, red onions, basil and toasted pecans dressed in a lemon tahini dressing. The recipe yields quite a lot of salad, but trust me, you will eat it, it is so light and delicious! 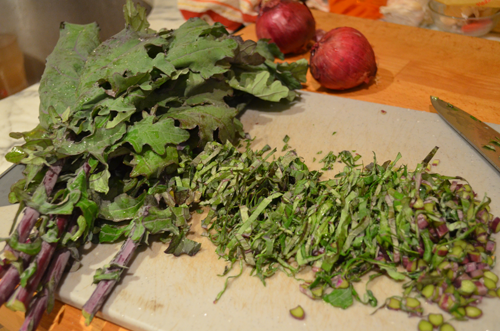 The salad will keep for a day or two in an airtight container.